Happy Monday! I wanted to share with you that yummy crostata I made a few weeks back via Instagram. Nothing like a yummy dessert to get the week started off right. Sadly, I can't partake in eating this until we are cleared of any food allergies that Vivi may have. I'm on a dairy-free and soy-free diet for the next two weeks to see if that helps Vivi's tummy. (More on that in another post since I have so much more to share about it.) So, please, please, please make this and enjoy it for my sake. I guarantee you won't regret it. This is a great recipe to use those sweet peaches that are still in season and to hold on to summer just a little bit longer. Recipe from Tyler Florence. *I've tweaked a few things which are noted below. I've made this recipe countless number of times and the one time I made it following the recipe to a T, it came out awful (no, really it did), so I highly recommend incorporating my tweaks. Trust me on this! - Combine the flour, sugar, salt, and lemon zest in a large mixing bowl. - Add the butter and mix with a pastry blender or your hands until the mixture resembles coarse crumbs. - Add the egg yolk and pour in the ice water; work it in to bind the dough until it holds together without being too wet or sticky. Squeeze a small amount together, if it is crumbly, add more ice water, 1 teaspoon at a time. - Form the dough into a disk and wrap in plastic wrap; refrigerate for at least 30 minutes. 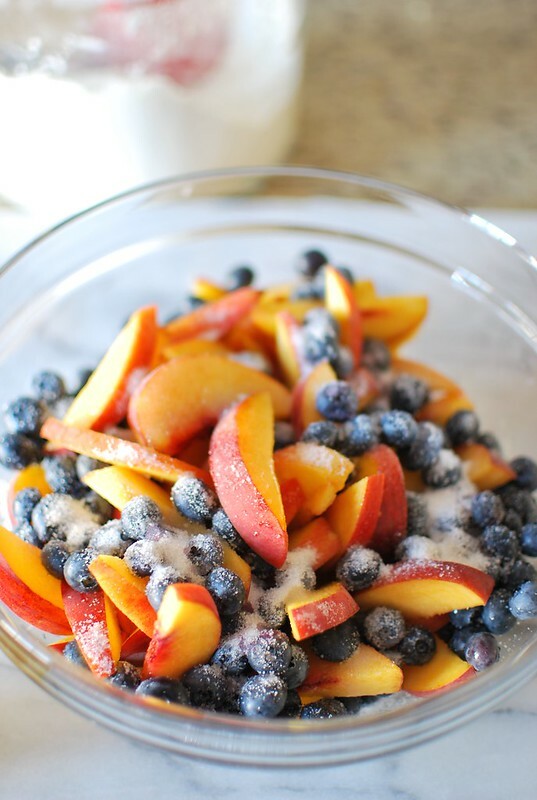 - Combine the peaches, blueberries, lemon juice, sugar, honey, and flour in a large mixing bowl. - Toss the mixture gently to coat the fruit. - Sprinkle the counter and a rolling pin lightly with flour. 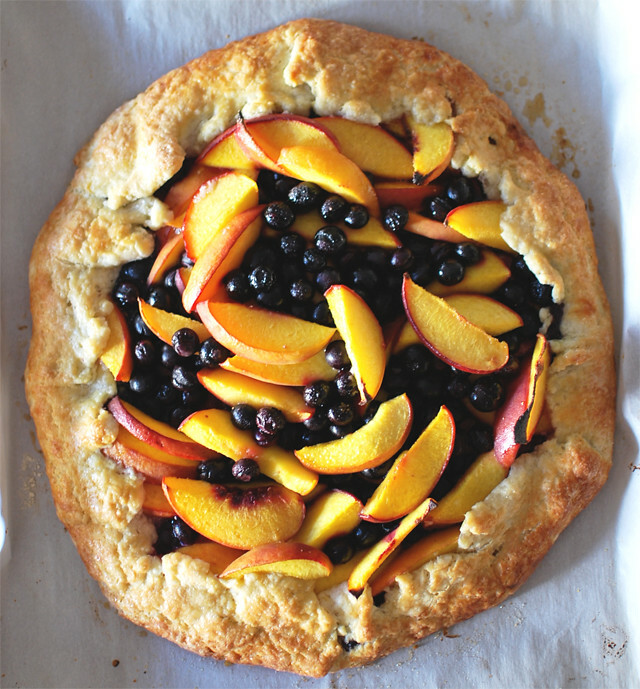 - Roll the dough out into a 14-inch circle, about 1/4-inch thick; it doesn't have to be perfect, free-form is the look you want for this rustic tart. - Transfer the dough to a lightly floured pizza paddle. I transferred it to a parchment paper lined baking sheet. 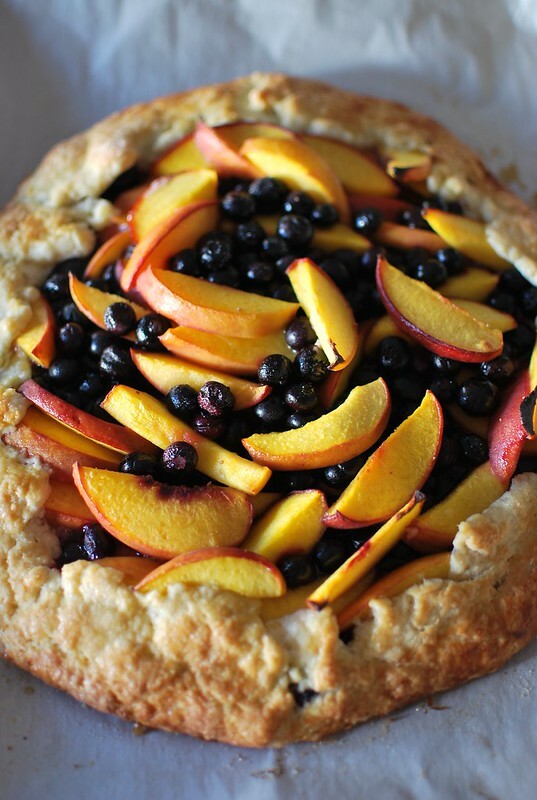 - Spoon the fruit mixture into the center of the dough, leaving a 2-inch border all around; brush the border with the egg wash. 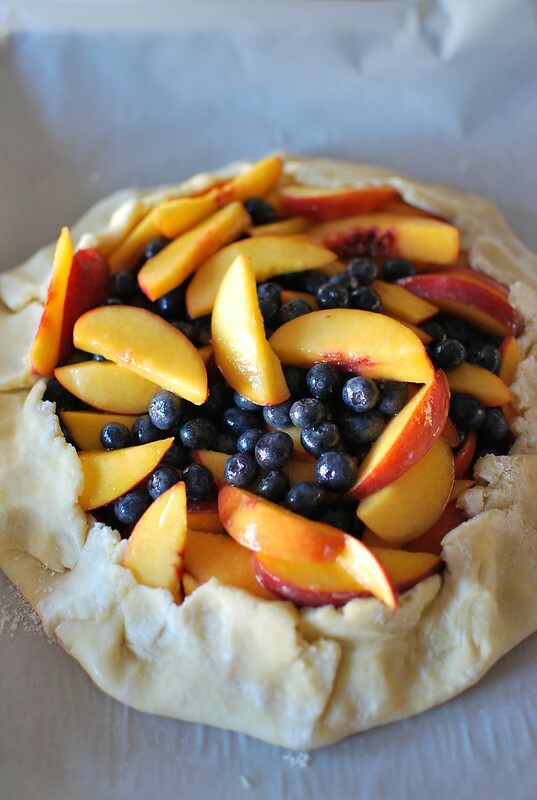 Lift the edge of crust over the filling, leaving the fruit exposed in center. - Gently fold and pinch the dough to seal any cracks. - Brush the crust with the remaining egg wash and sprinkle with sugar. 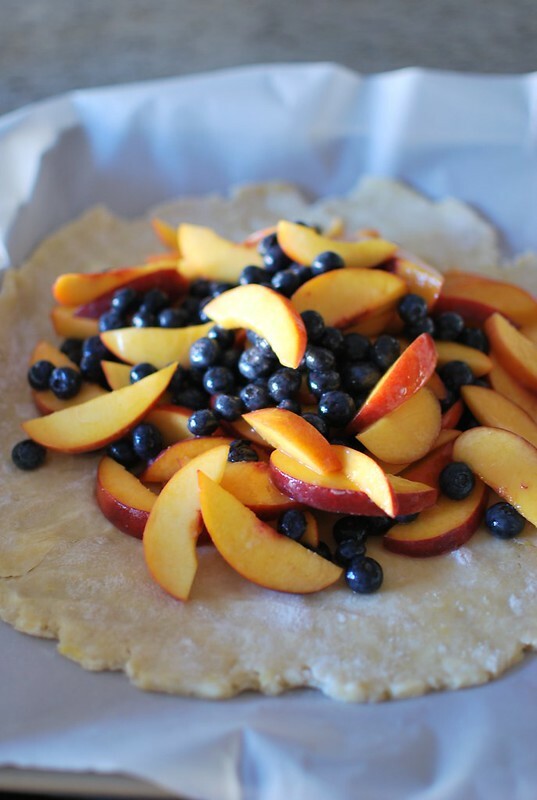 - Bake the crostata directly on the brick oven floor towards the front or on the preheated pizza stone for 30 to 40 minutes or until the crust is golden brown and fruit is bubbly and tender. This is what Tyler's recipe says, but I baked mine on parchment paper in a baking sheet to prevent any messes in the oven and on the baking sheet. - Serve warm or at room temperature with or without vanilla ice cream. Eat it as a dessert, breakfast, or snack!